Home > Booth & Co.
BOOTH MEN 1970s or 1980s: If you can provide the year, location and details of the event along with all or any names of those in the photo please use the contact form to let us know. We would like to have a fully accurate record. Some colleagues think this could be JSMB’s 70th Birthday held on 28th April 1983 in the Hawkwell House Hotel Iffley Oxford? Others think it was during the Turney years, prior to Garnar-Scotblair merger. Taken in a hotel, (Scottish Clan scenes on the pictures). Noted that there is no Bill Stewart, David Boyce, Jim Hillman, Frank Critchley etc etc etc, unless they are obscured faces? Ron Bennett (Pav) partial face to rear of above. Paddy O’Flynn (kneeling) Booth overseas/Ofro. Other one to rear of John Coggins not recognisable. Arvind Patel (Booth & Co England) sitting. Two to rear of above obscured. John Pittard (whose presence likely pushes us into the 1980s). Mike Redwood (Turneys) to rear/left above. Two people to rear David Bolle obscured.- Mike Green (directly behind DWB), & David Donald. 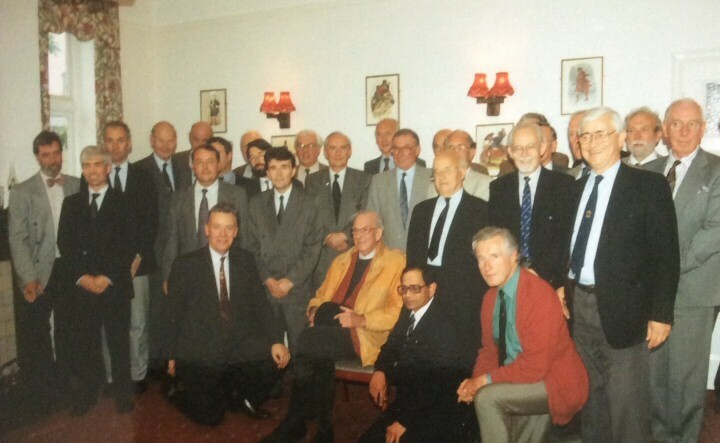 JSMB’s 80th birthday party was held in the Reform Club on 28th April 1993, but this was taken well before then. As of May 2018 I have just noted that there appear to be two sets of time line, people and the companies in the web site each of which has been updated a bit separately. Apologies for this, and I will spend some time correcting it when I finish my next set of travels. 1867 Thomas Fletcher joined as partner Appears to have worked in New York. Cousin and close friend of the brothers. 1869 Charles Herbert Wade joins Shaw’s Tannery in Grantham, UK (predecessor of Bjorlows) He was 13 years old but soon moved to Edward Turney & Co at Whitemoor Leather Works, which in 1901 was to become Wades. 1870 The Honourable Henry Romilly joined as partner Son of first Lord Romilly and grandson of Sir Samuel Romilly. His sister married Henry, second son of Mr Justice Crompton and first cousin of Alfred and Charles Booth. Spent the 70s in the USA, financial side of business, who was unwell much of the time and not hugely active. 1871 Charles married Mary Macaulay On 29 April 1871 Booth married Mary Macaulay, daughter of Charles Zachary Macaulay and Mary Potter, and niece of the historian Thomas Babington Macaulay. 1881 Booth Steamship Co Ltd formally incorporated, Capital of £200,000 in £10 shares. £81500 issued in first instance largely to existing partners in original four ships and to friends. 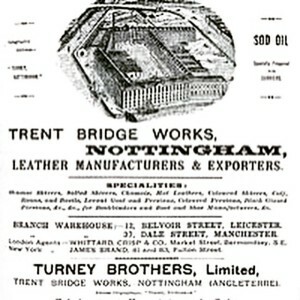 1882 Nuneaton Leather Co founded Booths needed to make something out of the roans. Charles Wade left Whitemoor and set up the small tannery at Nuneaton for Charles Booth. A Mr Johnson owned 50% and Booths 50%. 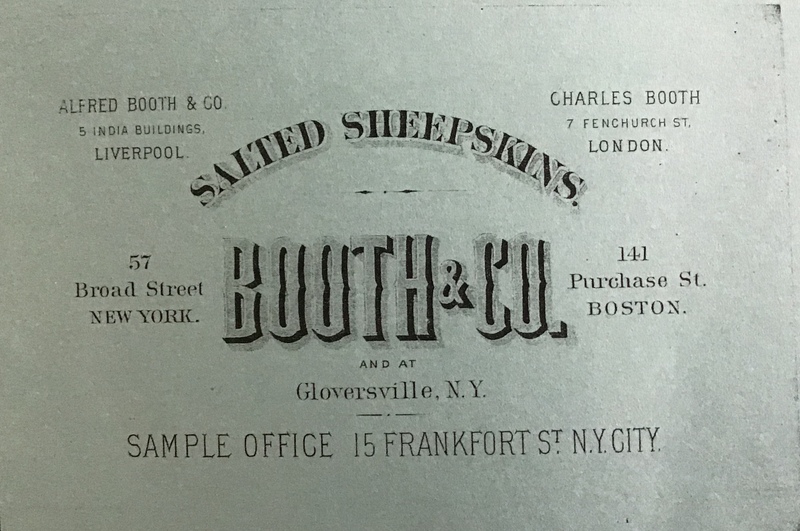 Mr Johnson supplies sheepskins and Nuneaton Leather split them sending the grains, salted to the US and splits were sold for chamois production in the UK. The plan was to make heavy grains better suited for the New York market sold as ABC. 1889 Schultz’ two chrome patents passed to Franco-American company Messrs Blumenthal Blumenthal then passed patents to Marcus Beebe and R.Foederer & Co in Philadelphia apparently via the Patent Tanning Co. of Philadelphia. 1892-1894 Booth started to market their Brazilian goatskins chrome tanned and finished in Philadelphia by tanner J.P.Mathieu Called Surpass it was a chrome tanned black glazed kid. 1901/1902 Julius Kuttner died on 8th October. George sailed out on 30th October and took charge of US for two years The younger Booths began to take over: George Macaulay Booth (24), Alfred Allen Booth, Enfield Fletcher. No Booth partner lived in New York from 1883 to 1901. 1901 The Singlehurst family decided to withdraw from operating their own fleet. The two companies amalgamated under the name of The Booth Steamship Co. (1901) Ltd. From the amalgamation of the the Booth Iquitos Steamship Co, Ltd. and the Red Cross Iquitos Steamship Co, Ltd. was born The Iquitos Steamship Co. Ltd. In 1911 The Iquitos Steamship Company was absorbed into the main Booth fleet. 1914 Alfred Booth dies November 2nd at age of 80 Son Charles was Chairman of the Booth Steamship Company and the other Alfred Allen Booth was Chairman of the Cunard Steamship Company. One of his four daughters married Prof Godfrey Lloyd of Toronto. 1916 Charles Booth died on 23rd November, 1916 On 23 November 1916 he died following a stroke, at his country home of Gracedieu in Thringstone, Leicestershire. He was buried at Gracedieu. 1920 Walter Kidde and Company engineers Erected a $1.5m plant in Gloversville for Surpass Leather Company. 1925 International Shoe Company signed a long term contract with Surpass for 100 dozen Black Glazed Kid from Mexican Skins. This turned into a long association. They had previously bought exclusively from William Amer Co.
1946 Charles Tanneries founded Charles Wade, Charles Booth, Charles Wade jnr. Everyone involved called Charles, hence Charles Tanneries. UK sales had been via Kohnstamm which Charles Tanneries replaced. 1946 Surpass tanning 1800 doz skins per day When I joined the Booth Group in 1946, Surpass was regularly tanning a total of 1,800 dozen skins a day, employing about 1,000 men. Skin supplies came from their own exclusive agents in Brazil, Argentina, China, India (which included today’s Pakistan) and Nigeria KC senior. The Surpass tannery was closed in the 1950s and contract tanning at other peoples’ facilities was tried for a time, until operations were ceased in the mid 1960s. Late 40s’ Bulleys Tanneries Ltd (Thika & Kahawa factories) Thika Built during1944/5 with Italian POW labour .TomBooth bought? 1973? Ulster Leather & Atlantic Tanning bought from UCT ltd Joseph Dub de Dubski, ex UCT joins Bulleys in 73/4 for short contract. 1981 Garnar-Scotblair buys Booths Became Garnar-Booth, to the disgust of the newly acquired Scotblair units. Alfred Booth & Co, 5 India Buildings, Liverpool. Booth and Co,( Inc,) 57 Broad Street, New York. 141 Purchase Street, Boston. Sample Office: 15 Frankfort St. New York City, and also at Gloversville, N.Y.
William Cunningham In 1890 joined Sydney Office. Cunningham moved to Gloversville in 1898 and later took over the pickled sheepskin department in New York.